Meet my dog Rocky. He loves people, but doesn’t’t like to be referred to as a sheep dog. Because he isn’t one. 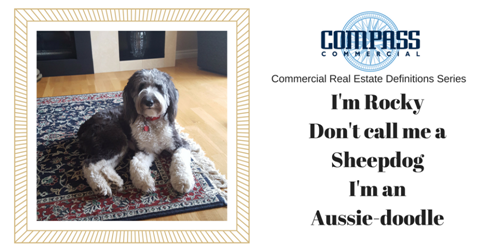 Rocky wants people to know he is a Aussie-doodle. What does that mean? His mother was a standard Poodle and his father was an Australian Shepard. He believes he is a fancy designer dog and is proud to be one! Sometimes in life we don’t understand the meanings behind certain words, and misuse them. If you own a business and lease commercial real estate you will want to have a clear understanding of industry terms, because a mistake could cost you thousands of dollars! For example, most people who lease retail space don’t understand what “triple net” means (written as n/n/n). “Triple net” means the tenant is responsible for all cost related to the building in which they lease except for the four outer walls of their space. A tenant unaware of this term and its place in the lease would be in for a rude awakening when they get a bill from the landlord for taxes, building insurance, and the cost to manage the properties. Throughout 2018, we will share terms we use in commercial real estate. This series will be called “Understanding Commercial Real Estate Definitions.” We believe the terms should matter to you if you are a tenant anywhere in the USA!